An award from the U.S. Department of Agriculture will help the SUNY College of Environmental Science and Forestry (ESF) develop a new graduate program integrating indigenous knowledge with scientific knowledge in service to sustainability. 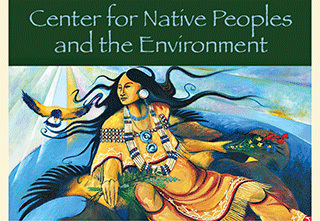 A three-year $652,811 Higher Education Challenge Award was presented to ESF's Center for Native Peoples and the Environment. The center's mission is to create programs that draw on the wisdom of both indigenous and scientific knowledge. The grant will fund "Sowing Synergy," a collaboration between ESF and the Salish Kootenai College and Hopa Mountain Native Science Fellows in Montana. The master's-level degree will be designed across the cultural and ecological landscapes of upstate New York and western Montana. "Indigenous knowledge of these landscapes is critical to understanding sustainability, yet we know of no graduate studies programs in the United States that integrate indigenous and scientific knowledges," said Dr. Robin Kimmerer, director of the center and a principal investigator on the project. "We are thankful to be working in two of the richest sources of this knowledge in the country." The grant will support three Native American graduate students and four undergraduate research apprenticeships and involves new course development, publications, and faculty workshops designed to link Traditional Ecological Knowledge and Scientific Ecological Knowledge in research and education. Higher Education Challenge grants support the next generation of professionals entering the food, agricultural, natural resources and human science workforce nationally. Native Americans are the most under-represented group in the American scientific community, and are "barely a presence in science," according to a report of the National Science Foundation. A 1991 study found a "consistent and nearly complete absence of American Indian faculty members in science and engineering". Sowing Synergy follows the successful 2013 Challenge award to the center for a partnership with the College of the Menominee Nation in Wisconsin titled "Learning from the Land." That project concludes in 2017 with a national workshop. "The time is right to build programs in science education that honor the wisdom of indigenous knowledge," said Kimmerer.